The world of work is awash with relentless changes, troubles and crises. In the midst of these uncertainties, your boss does not need surprises from you or any of her employees. Bear in mind that your boss’s output is the aggregate of the outputs of all the members of her organization. She must be in complete control of her goals and be able to answer her boss’s questions about the status of her organization’s projects and progress made on the latest crises. Consequently, she does not expect to be blindsided by good or bad news on your projects. She needs to know the status of each of your significant projects, and the challenges and opportunities therein. A surprise is simply the difference between a previously-identified goal of a project and its apparent result. Give your boss a heads-up: have a conversation with her about forthcoming opportunities or mounting problems as soon as you perceive these variations in the output of your work. Suit your boss’s preferred style of communication. If she is organized and detail-oriented, she may prefer comprehensive written reports itemizing the status of your projects, financial expenditures, and, performance against set goals and budgets. In contrast, if she is informal and perceptive, she may just need you to summarize the status of your projects in an email each week. 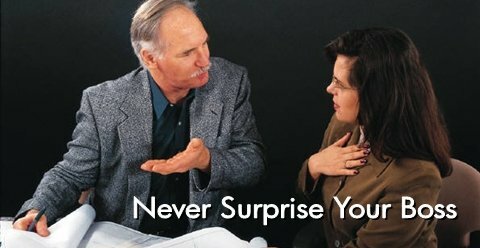 In meetings that include your boss, her boss, peers or customers, never introduce a contentious topic or discuss positive or negative details of your project without preparing your boss ahead of the meeting. Make it a habit to meet with you boss prior to such meetings, show her drafts of your presentations and seek her comments and inputs. By ‘pre-wiring,’ or, discussing your findings and recommendations with key decision-makers ahead of a group presentation, you ensure their support for your conclusions and avoid surprise reactions or disagreements. See my earlier ‘Ideas for Impact’–article for details on the technique of pre-wiring. As a rule of thumb, your boss should first learn about any surprise from you–not from her peer, her boss, customer or consultant. Recognize that, occasionally, you may not have discussed certain facts or figures with your boss solely because these details appeared irrelevant or unimportant to you. However, others may be experienced enough to foresee the consequences and, much to your chagrin, bring up the details with your boss. If your boss asks, “Carrie from accounting told me … why you didn’t tell me that?” acknowledge that you did not foresee the consequences. Learn from your lapses and discover how you could read such trends. If you see a need to reassess your goals and priorities on a project, bring it to the attention of your boss. Involve her in evaluating the challenges so that she feels just as accountable in redefining your common goals and priorities. Be prepared to clarify your thoughts and offer alternative solutions. The relationship between you and your boss is a sensitive one–one that hinges on mutual cooperation, credibility and trust. Trust is a virtue that depends on the predictability of your behavior, honesty and dependability. If you surprise the boss repeatedly without forewarning, she may begin to mistrust you. Your boss is important to you because she is the primary source of approval of your work. And, the relationship with your boss is a critical aspect of a favorable work atmosphere and your job satisfaction. Success in building a relationship with your boss does not come easily. It begins with recognizing that this relationship hinges on open communication, cooperation, and credibility. The onus is on you to effectively manage this key relationship and achieve the best results for yourself, your boss and the organization. Never keep your boss in the dark. 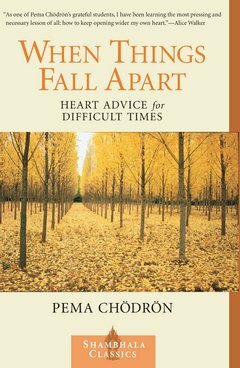 Buddhist nun Pema Chodron's treasury of wisdom for overcoming life's pain and difficulties, and ways for creating effective social action.